You know that feeling you get when you scroll through your Instagram feed and see pictures of girls all posing in the same hotspot restaurant and wish you were eating there? Or an unrealistically tanned and toned Instagram couple traipsing on a private, tropical beach somewhere hand in hand, and next thing you know, you’re looking at flights? Or back to the same group of girls all posing together in the middle of a Parisian boulevard or New York City avenue, oddly dressed the same, and finally that urge kicks in where you tap on each of their profiles looking for the links to their outfits? Yeah, that’s call the Instagram Effect. And it’s bad. What is the Instagram Effect? Simply, it’s the influence of our spending habits through Instagram. Booking more trips, eating/cooking the most picture-worthy meals, and of course, shopping for the trendiest clothes. I can’t really hate on people expanding their horizons with more travel and culinary tastes, but it breaks my heart to see all the WASTE we are influenced into buying. 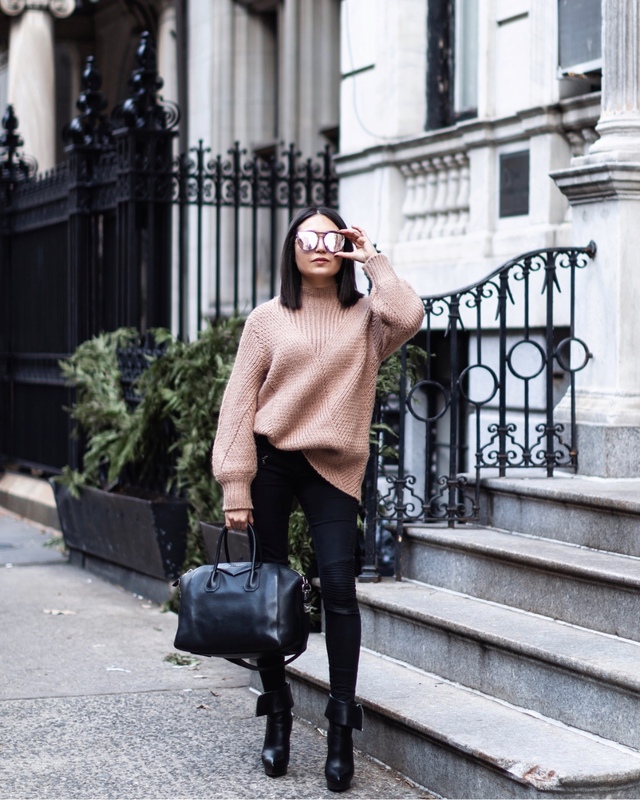 Fashion blogger influencers dominate this market, but sadly most don’t realize how the unrealistic constant rotation of clothes (seriously, most never wear the same thing twice!) has been the number one cause in the rise of fast, and now ultra-fast fashion. Appreciate What You Have. My life mantra ‘gratitude is the attitude’ plays a big part here. In the last year and a half, I’ve notably cut down my shopping habits, by choice, and have really learned to appreciate my capsule-esque closet as it is. And for all you Marie Kondo fans out there, choose to keep what sparks joy! Try A Capsule Closet. Now I’m not totally living off a capsule closet, but I have learned to stick to a neutral color palette I enjoy wearing and re-wearing. Do I still get that urge to invest in another pair of black skinny jeans? Yes! But do I do it? No. I’m very happy with the two I’ve kept in my closet. Plus, it’s just so much more chic to have a more minimal, neutral closet. Case in point: Gabrielle CoCo Chanel. Invest In Better Pieces. You can read all about how I invest in pieces on my millennial budget HERE! But think about it, wouldn’t you rather have a basic white shirt that stayed intact for years instead of buying a new one at Zara every few washes? Try Closet Sharing. Rent the Runway is the ultimate source for your never ending closet! And if that doesn’t work, there’s always thrifting and resale! Learn How To Accessorize. And now for my ~*lEwk*~. What do you notice about the following photos?? I’m wearing the same thing!!! Same jeans, same sweater, same boots, same bag. I only switched out the sunnies and added a leather jacket and voila! If you’re really observant, you might even recognize that I’m wearing the same jeans, boots, and bag as my last style post HERE. Why does this work? Because I’m using timeless pieces in classic colors that I’ve invested in and look good on me—and I can re-wear as many times as I want and still look fierce AF!